Though I have read plenty of books pertaining to women, it doesn't seem that there are bountiful books for women who seek to be a godly wife. Or maybe I just haven't looked hard enough. I'm not sure. When I saw Bluerose's Heart review The Beautiful Wife, I knew I wanted to read it, too. If you are a married women, whether your struggles abound or are few, I really do recommend this book for marriage enrichment. Some of it was review for me while other bits were new. The Beautiful Wife is about being attractive to our husbands-inwardly. I was incredibly impressed with Sandy Ralya's book The Beautiful Wife. She is not preachy. She is honest and candid and has overcome plenty of problems in her own marriage. She also shares some areas where the struggle continues. 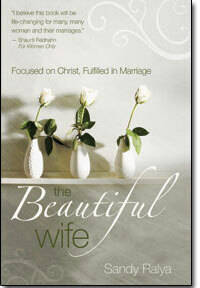 The Beautiful Wife is full of practical ways for women to be a better wife to their husband. Prayer and communication are focused upon throughout as the most practical advice with many references to Scripture. Below are a "few" passages from the book that I want to remember, written in my own words. Consider them "Notes to Self." Your own happiness and fulfillment are dependent upon whether or not you seek God in all of the circumstances I face. In a prayer journal, include a list of verses just for your husband. Look for truths you desire to see manifested in his life. Prayer is always more effective than arguing or nagging...and it brings him good, not harm. When discussing marriage in a community of women, focus on sharing your own weaknesses and issues instead of your husband's. When talking about him, be as vague as possible. I have found it is important to consider how he would feel if he were to hear what I am saying since my husband is also rather private. Consider Proverbs 15:28, 17:22, and 11:13. When you are tired and worn out, you are more likely to respond poorly to any conflict. Caring for yourself provides benefits for you and your spouse/family. Just because it is easier to be critical and dissatisfied does not mean we should give in to it. Here is where I reminded myself that I need to purposefully choose gratitude and thanksgiving every day. Not all things a husband does is sin. Sometimes we are just annoyed. Just because I am annoyed does not mean he is sinning. Always remember that you cannot change him, only yourself. Before we can love others, we must first love God and receive his love. Silence does not signal to the husband that we hurt...silence is not communication. Before healing can take place, we must communicate our hurt. When we covet what others have we are overlooking God's provision. James 3:5 Remember that attitude (and what is said and how it is said!) is everything! This book can be read by individuals, but it is also one to use with a mentor or group setting if that is something you have available to you. It would also be a great gift for an engaged or newly-married woman of any age. Thank you, Kregel Publications for providing The Beautiful Wife for review purposes! I know it has the potential to change many lives! I'm glad you liked it! I really need to make time and read it again. I agree that this one is definitely a "read slow and savour" kind of book. It does sound like it would be really promising with great things to think about. And two positive reviews from two bloggers I like and trust?! Well, now . . .